‘Charlie’s Patch’ in Bowden Street is a small community guerrilla garden opposite the house where Charlie Chaplin once lived. It was formerly a neglected area of waste ground, used mainly for fly tipping. In 2012 residents got together to clear the site. 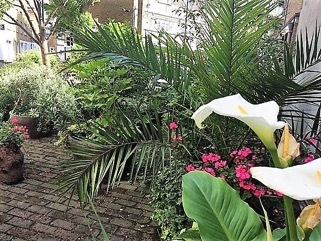 We began by planting spring bulbs and gradually over the last five years we’ve added large tubs and more planting so that the patch is now an oasis of greenery and colour throughout the year. Local residents of all ages and backgrounds get together regularly to plant, weed and tidy. They include nearby flat dwellers without gardens of their own. The planting features flowers particularly attractive to butterflies, bees and other pollinating insects.